Work for PiiQ by Cornerstone? "Very good experience so far. We are still Learning." Easy to use. The ability to import trainings. Good Record Tracking. Courses keep incrementing in variety. We should be implementing this product fully on 2019. The ability to run reports on the status of completion across the company, goal completion, 360 feedback and use of the LMS allows us to have a big-picture view of the company employees and makes it easy for the managers to hold improve everyone performance on all levels. The courses offer should be expanded to have technical training such as FEA, CAD, Welding, Engineering, Hydraulics, etc. We would love to submit a request in the learning portal for courses that are not in our package that we would like to add to the system. For example, if we need courses related to the aviation industry, to maintenace, repair and overhaul of engines, of mechanical design and analysis as well as FEA softwares. We would like to be able to search other partners (from the learning portal) to see if there are courses in other packages or from other providers that we could purchase. Course offerings are not technical in nature. PIiq can improve this. In the mean time you have the ability to import your own trainings. Continued training to employees. Consistency throughout the Company. Recording progress. We have not yet realized the benefits as we are currently on the implementation phase. Next year (mid 2019) we should be able to provide a better review. Thank you so much for taking the time to review PiiQ! I am so glad your experience your experience thus far has been great. I know you are still working on implantation and I want to make sure you know that we're here if and when you need any help. Thank you for providing feedback around the courses that you'd like to see. Although we currently only partner with CyberU as a content bundle offering, we are looking to expand. I have taken your feedback and have passed it on to our content team directly. Any time you'd like to request content, feel free to reach out to me at bgoodman@csod.com and I'll happily pass it on to our team. I look forward to our continued partnership. If there's anything I can do to help, please don't hesitate to reach out. One advantage is that PiiQ gives jobs and abilities, yet enables you to build up your own particular to your association. They additionally give layouts, or you can make your own. Other favorable position is the capacity to run provides details regarding the status of fulfillment over the office, objective finish, 360 criticism and utilization of the LMS enables us to have a major picture perspective of the organization and makes it simple for me to consider everybody responsible on all levels. A standout amongst the most focal points is that the extraordinary highlights offered, for example, the capacity for representatives to set their own objectives and BOTH the chief and worker having the capacity to set-up registration puts the power in every worker's hands and guarantees that there are no reasons regarding why there hasn't been ceaseless criticism consistently. I profoundly prescribe this product it is easy to use, supports the improvement of SMART objectives and is moderate - notwithstanding for a non-benefit association. From an user point of view, I didn't know to what extent the back-end set-up would take. This wasn't so much an issue until the point when I understood we needed to physically enter all appraisals (there ought to be an alternative to pick a rating scale set-up for "all"); and physically incorporate the remark box (since remarks are "discretionary" at any rate, there ought to be a default box to watch that all abilities get a remark box. Sub-skills ought to likewise get a remark box (maybe with less characters) so individuals can include remarks beneath every versus adding their remarks to the general competency remark box. What's more, more regrettable, I needed to appoint jobs to remark boxes which appeared like a pointless activity. Ideally they can enhance this capacity in one of the following updates. You only need to use an smart device and a network connection !!! Also if you have any problem you only have to contact with the technical support and they will give you an answer. This is an intense apparatus that will keep us educated of holes in aptitudes and execution, enable us to distinguish superior workers for headway openings and low entertainers for formative needs. Since the objectives are shared among supervisor and representative we foresee a higher rate of accomplishment in accomplishing our central goal in our Clubs. Our desires for PiiQ programming are high and we anticipate finishing an audit once we have been utilizing the apparatus for in excess of one cycle. There are so many training courses that cover every traditional organizational topic we need, including specific to the construction industry. Additionally, there are personal improvement areas that are unique to individual growth. The customer service of the sales rep and implementation rep are unbeatable. They are kind, patient, and understanding. The reporting analytics could have additional functions. I have been told that the newest software updates this year should have the capabilities that I was asking about. Use the time of the trial to really understand the admin capabilities and schedule as many conference calls as you need to help with the sales process. I scheduled weekly calls, asked for a catalog of courses (you don't get to demo everything), and I was honest about my budget and needs. My Sales person was very responsive and she was extremely knowledgeable about the product. The implementation was extremely easy and user-friendly. You set up your unique customized settings, you create a report to load, and then just load the report. There were absolutely no errors with any profile after the report loaded, and the system is literally ready to go! We are using the learning module of PiiQ by Cornerstone to provide compliance training, safety training, and skill gap training - such as training for new managers, customer service training, and business ethics. The software is ready to go at this point and now were are starting to roll it out. We intend to have required courses for HR compliance and safety, have recommended training for self-improvement, and required training for underperformers. Thank you for your feedback! We're so happy that you are enjoying PiiQ's LMS and using it to deliver compliance training, HR training, and skills training. We're thrilled to hear that setup was easy and you like the variety of courses available. Please continue to share feedback such as reporting needs with your Account Manager or the Support team. Hopefully the roll out was smooth and your employees also love PiiQ. Once again, thanks for your feedback, and we're glad that PiiQ is helping your company with its training and career development initiatives. PiiQ is a modern, easy-to-use performance review tool. The personalization allows for customized questions to ensure specific responses. The managers love the goal-setting and 360 tools, as well as the nine-box matrix that provides a bird's eye view of their teams; and having all the information in one place helps us track performance year after year. The initial set-up of PiiQ takes some time, especially if you are going to create your own competencies, but we have made some adjustments to ensure this is easier in our second year. Keep your number of competencies to a minimum and you will save time during the initial set-up. PiiQ allows us to have a formal review process - something we have not had in the past. The nine-box matrix allows us to see who the high performers in the company are at quick glance. Most of all, it holds both employees and managers accountable with tight deadlines, specific measurements and the ability to create competencies specific to each role within the company. Thank you so much for your feedback and I am so glad that you are happy with PiiQ. I enjoy working with you so much and absolutely love your drive to empower your managers and employees via PiiQ. I also really appreciate you providing feedback around the set up process and your experience. Just so you know, this is something that our development and support team is working on to ensure a great client experience from start to finish. I look forward to continue working with you! "I am the administrator of the system"
It is easy to implement and deploy. It offers a lot of opportunity in training to our people. Our employees appreciate the large range of training. It help us to identify and see the trend in our employees in term of learning and help us to see how to develop further their skills. In term of performance, it is easy to use, the report and analytics are very useful tools for us. It lacks for us in term of training in our domain (pharmaceutical). he has all the reminder when a cycle is starting but It lacks reminder for when the cycle is coming to and end. Some time it could be painfully manual, for example when we have to update our rating, it will not be updated for the existing individual competencies, so we will have to change it manually for each one. It has helped us to improve our performance review and to provide training to our people, which we were lacking before, we have move from a an painful performance review to a performance review that is done seamlessly and both our manager and employees appreciate how easy it is to use. It has improve our performance review, that was a painful exercise, manual, with excel sheet to a cloud base easy to use system. We have now a closer relationship between our manager and employees, as we are able to have shorter cycle review. Thank you so much for reviewing PiiQ. I'm glad to see that you've found the training courses beneficial to your employees and that your relationships with managers and employees have improved. That is awesome to hear! I also really appreciate your feedback around how we can improve - more industry relevant courses, additional review cycle reminders, and manual changes to the competency scale. I have shared this with our product team. We always love to hear feedback from our clients. Feel free to reach out to me at any time at bgoodman@csod.com. Thanks again for reviewing us! Piiq has been a robust, yet simple and user-friendly tool for automating our performance reviews. It has an engaging design, and the online guides and videos added in a recent release have simplified training for new users. We would really like to see a mid-year check-in process added. We have been told this will be in a future release, but we had a few performance cycles without it, and it was complicated to explain to managers and employees our work-around to update but not submit a mid-year review. Streamlines the goal setting and performance feedback process. Documents goal setting for all employees and provides us transparency into how many managers/employees are completing the process. Thank you for reviewing PiiQ! Your feedback is really helpful and I'm so glad PiiQ has helped to automate performance reviews. I wanted to also let you know that you can use the Check-ins feature to maintain and track ongoing performance conversations. The Support team is available at piiqsupport@csod.com if you would like to discuss check-ins and manager note taking. Thanks again for your feedback! "Cornerstone is Awesome and their Customer Support is even more AWESOME!" Since implementation we have met the goal setting, mid year review and year end review deadlines across the entire organization. The reporting features make it incredibly easy to identify outstanding performance management activities and notify users. Thank you for your feedback!! I'm so glad you moved with us from Growth Edition to PiiQ, and felt supported by us and people like Dan along the way. Dan is awesome, smart, and hard working and we're lucky to have him at Cornerstone. Be sure to explore the Check-ins feature and reach out to your Account Manager or Support if you need help. Once again, thanks for your feedback. "Transforming the Performance Review Using Piiq by Cornerstone "
Easy to use. Help software links and videos address most of the common questions. Competencies and Goals can be customized to suit your needs. New check-in feature is very helpful along with a new MidYear Review template. The initial setup of roles (jobs) took me a while to complete. Once this is done, there is no need to re-enter except to add or delete roles. Excellent choice for SMB's looking to transform the performance management process and improve employee engagement. Like many companies, we're transforming our performance review from the traditional annual meeting to more frequent check-in meetings that encourage more communication and fewer surprises at year-end. Piiq has made this transformation possible by providing tools that both employee and supervisor can use and manage. Thank you so much for your feedback, Gene! We really appreciate you taking the time to let us know your experience with PiiQ. I'm glad our new feature, Check Ins, a tool which allows for ongoing feedback, is helpful to your managers and employees. I truly enjoy working with you and am excited to continue doing so! Please let us know if there's anything we can do to help. Though we are happy with the actual program, it's the customer service staff that stands out. They are very responsive and willing to think out of the box if they have to. I'm not sure how to fix it, but we pay a cost per user even if the user hardly uses the software. The ability to incorporate our own training program and our team to be able to access all the other training programs as well...great benefit. Easy integration and great technical support. Staff are very professional and responsive. Any updates are frequently communicated with the users. I like the fact that we have the flexibility to manager and add additional tags, for the purpose of reporting. The system does not allow to deactivate employees. Also, the 360 feedback request can be only sent to internal users. In our case, we sometimes want to extend our request to our clients or customers. The way how weighting is set up can be very confusing to many of us. To make it easier, most of our managers use equal weighting. Streamline and simplify the performance management process. Thank you so much for taking the time to review PiiQ. We're glad that you've had a good experience with our support team. And I am happy to hear that you like the tagging that's available! I also appreciate your feedback around the employee deactivation and 360 feedback. Just so you know, you are able to make an employee inactive, but I would love to learn your exact needs around that functionality to bring back to our team. Same with 360 feedback, I'd love to understand how you are looking to send external 360 feedback out so that I can share this with our team. Please feel free to reach me at bgoodman@csod.com to discuss above. "Excellent solution for small and mid size businesses"
The PiiQ solution is user friendly, with screens that are intuitive and easy to navigate. The new monthly check in feature is a great communication tool for employees and managers. The administrator functionality is comprehensive and easy to use. It's so easy to add, move, and/or delete users and manager assignments. This is a tough one, because it's just right for small to midsize businesses. I think allowing senior managers to see a subset of their direct reports (by team) would be helpful. Excellent cloud solution. Great tech support on rare occasions needed. Clear communication of goals, progress towards completion, feedback on competencies, and career development goals has improved the awareness of our teams in understanding the key focus areas for performance. The acknowledgement and goals for competency improvements needed has increased the skills of team members. Thank you so much for reviewing PiiQ! I am so happy to see that the solution is working for you and that you've found our Check Ins feature to be a helpful tool for managers and employees to communicate. That is exactly what we want to hear! In regard to your visibility comment around senior managers, extended team reviews can actually be seen via the 9 box grid. Here's how managers can access those reviews: https://help.piiq.csod.com/docs/view-employees-manager-review-1. If you would like to learn more about how to use that feature or any other one, please don't hesitate to let me know by emailing me at bgoodman@csod.com. "Taking something Hard and Making it Easy!" The tool is so detailed and covers all the needs our organization has, but still the PiiQ team makes it all seem seamless and easy. I recommend the PiiQ by Cornerstone tool to anyone that values employee development. Evaluation, action planning and specificn professional development all in one tool is spectacular!!! Our agency created an evaluation system (paper) but didn't always follow through. The PiiQ Cornerstone system automated our system and now reminds us when we need to evaluate, touch base, or set up professional development. We are now using the tool and staff development is improving as a result! The ability to streamline your training process by organizing training from multiple resources into one spot. Would like video from URL links to immediately display in the chapters. Would also be nice if you didn't need to open another tab to start URL link training. If you are looking to enhance your training effectiveness, PiiQ is your solution. We are effectively able to manage the creation of curriculums that support the needs of the user. Not everyone needs the same training, and this process has allowed us to target the individuals needs. Thank you so much for providing feedback and great to hear that PiiQ was able to streamline your training process and enhance training effectiveness! Currently, we do support adding an external link as a chapter to a course. Since these are external links to an outside source though, we will not be able to launch these links within our course player. We are however looking to expand our range of compatible formats and embed more video files so you could store the training in-house to PiiQ. I will provide your feedback to the Product team as we further consider our options. Thank you again for your response and we look forward to continue working with you! "Decent system, could use some work"
I like that the system has a lot of customization options. This makes it convenient for companies of different types to use this system. I'm not sure fond of the new upgrade. The previous version definitely needed some work, but I feel like the new upgrade took some of the items that needed work and went a little too far with them making some things more difficult. Thank you so much for providing us feedback around PiiQ. I am glad to hear that PiiQ allows you to customize the tool to fit your needs. I also very much appreciate your feedback around the upgrade want to learn what features you feel are difficult to use so that we can turn your experience around. I'll send you an email separately so that we can discuss. Thank you again for providing feedback and I look forward to continue working with you! PiiQ is a fantastic system allowing us to set goals, measure competencies and evaluate performance. For a small non-profit, the ability to professionalize our performance process, while also keeping costs down, is a big plus! I dislike that there is not drag-and-drop functionality. Reordering goals and competencies is cumbersome. Easy and efficient performance reviews, goal setting and goal tracking! Thank you so much for providing feedback and great to hear that PiiQ was able to professionalize your performance process! Currently, we do have a way to reorganize the goals and competencies in the Content Library but through the up and down arrow buttons that move the items on the list. We do understand though that the Content Library could be more user-friendly with something like the drag-and-drop functionality. I will provide your feedback to the Product team as we continue to improve the system and provide better client experience. "Top Tier Performance Managemet and Learning System"
What I like most about Piiq is the user interface. It is intuitive for the end-user and administrators. I also appreciate the reporting capabilities and mimic access. When employees or managers print the actual review document, the format is odd - no headings, pages are not numbered. The print out version of a performance view needs to be updated. It is difficult to read through the information and find specific data points. Learning. As a small company, we do not have a centralized location for all learning and Piiq will help us accomplish that in 2018. "Company Superuser - 3 years on GE / PiiQ"
Interface / the Look & Feel of the product. The fact that I can't build my own reports. Make an event of implementation, and bring staff on the journey. Moving towards 5-90-5 bell curve. Helping line managers to have honest discussions with team members. Thanks for your feedback on PiiQ! We're really excited to hear that you like the interface/look/feel of the product and that PiiQ has helped with line managers having honest discussions with their team members. We understand that, as being a long time user of ours, you may have other details aside from our standard reports that you would like to extract. We are curious to know what those may be. If you have the time/chance, we'd love to hear that feedback via piiqsupport@csod.com. Thanks again for your years of support and look forward to continue working with you! Thank you so much for providing feedback. I am glad you are finding PiiQ to be flexible in goal setting and performance reviews. We are so appreciative of your constant feedback. Please know that this is really valuable to us and our team and your feedback does get shared with our product team. I know we've had some calls around features that you'd like to see on Cornerstone, including Development Plans. Please know that we continuously push out new features and hope to cover some such as Dev Plans in the upcoming quarters. I look forward to continue working with you. Please let me know if there's anything I can do to support. "Started using Piiq for our yearly performance reviews"
What I like best is that we can make edits manually when we on board employees or create new roles. Previously we had to send in an excel to support for any necessary changes. It is still somewhat confusing when creating roles and criteria for performance reviews. Thanks for your feedback on PiiQ! We're really happy to hear that you enjoy the new admin controls and self-service features which better streamlines the set-up process. We would love to know what was confusing for you when creating roles and criteria for performance reviews. Our Support team is readily available to assist with any questions you have. Please contact us at piiqsupport@csod.com. If you would like to look through a walk-through on these sections as well, our Help Center, help.piiq.csod.com, has comprehensive guides that you can use as reference. Thanks again for your time and hope to hear from you again! being able to batch assign courses since we do large hiring cycles. paying for licenses for people marked inactive when they aren't accessing content. We have summer employees that take mandatory courses and if they are offered positions the following year, we either have to decide if we delete their accounts to not pay, or mark inactive to store taken courses but pay for them. Thank you so much for reviewing PiiQ! I really appreciate your feedback. I would love to better understand your hiring, timing and quantity of your summer employees to see if there's any way we can accommodate your needs. Can we set some time to chat? Please feel free to email me at bgoodman@csod.com. "Continuously Improving Performance Management System"
We love the 9 box and the simplicity of PiiQ! We love the check-ins, which allow employees and managers to frequently check the progress of a goal and provide continuous feedback, as well as adjust going forward. Always coming out with new and improved features; seamless upgrades. We wish our competencies could be applied to individual goals/sub-goals. We also think we should be able to include attachments in goals and reviews. We went from paper reviews to electronic reviews. Everything is now easily accessible and simple for our employees. It's also nice to provide continuous feedback! I am glad you have found the analytics 9 box grid and the check ins feature to be helpful to you and your teams! Ongoing feedback is a feature that is very important to us and to our clients, so I am happy to hear that is it being utilized! I also really appreciate your feedback around the competencies tied to goals and the ability to attach documents to the reviews. These suggestions have been passed on to our product team. I look forward to continue working with you. Please don't hesitate to let me know if there's anything I can do to help. Input of goals were lost several times during setup. Not user friendly like we were told. Just started using it about 6 weeks ago even though we had it for 10 months solving problems with it. Thank you so much for your feedback, we really appreciate it. I am sorry that you've had a negative experience with PiiQ. At Cornerstone, we strive to always have the client's best interest first and if we've missed the mark, I sincerely want to apologize. Our support team and myself have been working with members of your team to ensure that your system is set up in a way that will work for you. There are different ways to set PiiQ up, depending on your review cycles and how goals and comptencies are set up on the back end. We're glad we're working together so that we can help you set PiiQ up in a way that will work for you. I'd love to speak with you further if you'd like, about your experience, as we're always looking for ways to improve and ensure our clients have the best experience. Please feel free to email me at bgoodman@csod.com. I'd love to help turn your experience around. "As a medium sized business, PiiQ provides more than sufficient learning content and topics." Would like to see more reporting options and capabilities. Robust training options for employees and managers. We were able to create and in-house leadership training program using the courses available in PiiQ. We supplement our on-boarding/orientation process with courses from PiiQ. Thank you so much for taking the time to review PiiQ and I am so glad your employees are finding it easy to use! And it is also exciting to see that you've been able to use the courses to create a leadership training program. That's amazing! I appreciate your feedback around reporting functionality. If there's a specific report or capability you'd like to see, please don't hesitate to let me know so that I can provide detailed feedback to our product team. As always, feel free to email me at bgoodman@csod.com. I appreciate our partnership and if there's anything I can do to help, please don't hesitate to let me know. "In Depth Program - Difficult to Use"
It is a very robust program, with lots to offer, maybe even too much! It is not very intuitive and is difficult to "hit the ground running". Very difficult to configure for the way our company tree is structured. We utilize PiiQ to identify goals and manage the review process. Thank you for providing feedback on PiiQ! We're happy to know that PiiQ has helped with identifying goals and managing the review process. We do love to provide as much resources as we can to our clients so to build higher optimization of PiiQ. However, we do understand that the task could be challenging if your organization has specific needs. Our Support team at PiiQ is more than happy to be able to assist and guide our clients through the process. If you have a specific structure to your company, please do let us know at piiqsupport@csod.com and we can provide the best practices for you. Thanks again for your time and we hope to hear from you soon! Thank you so much for your feedback on PiiQ! We're happy to hear that PiiQ has helped lessen the subjective review nature and provided a way to electronically have goals and competencies. The PiiQ team is constantly working to ensure clients will have a successful client experience. We're more than grateful to understand our clients' needs and develop new features and enhancements. If you do have any specific feedback in which would make the system more admin-friendly in your opinion, please reach out to PiiQ Support at piiqsupport@csod.com. Thank you again for providing feedback and we hope to continue making the system user friendly! "Intuitive - Minimum training needed"
The system is very easy to use. With minimum training you can start your evaluations. Some of our users like to print evaluations. The system does not have a good printing option. Thank you for your feedback on PiiQ! We're so happy to hear that PiiQ is easy for your users to use and only a simple onboarding is needed. We have heard our clients and their feedback on the printed format of the reviews and have recently made some updates! We have enabled self-reviews to be exported as well. If you haven't had the chance to see the new print (now called Export) feature, please take a look and feel free to provide any further suggestions. You may reach us at piiqsupport@csod.com. Thank you so much for your feedback on PiiQ! I am so glad that you're having a good experience with our product and am happy to hear that it is easy to navigate and intuitive. I really look forward to continue to work with you! If there's anything we can do to help, please don't hesitate to let me know. Very happy with the updated admin functions, very user friendly. The old format was very time consuming and need the assistance of a Cornerstone employee (who were always very helpful!). Not sure if some of the training courses disappear over time. Happy with the tool. It will satisfy your need to have a formalized evaluation process that is easy for your staff to use. Compliance training, employee training, annual evaluations. Thank you for your feedback! We're so happy that you are enjoying PiiQ' Performance and Learning, and using it to deliver compliance training, skills training, and formal annual evaluations. We're also thrilled to hear that the new and improved admin functions have benefited your team. Regarding to the training courses "disappearing", I am assuming you mean the CyberU courses in which our content partner, CyberU, regularly updates the course catalog to ensure best-in-class learning. This does mean that they do remove courses if outdated. Rest assured though that your transcripts are still maintained and newer, more relevant courses will replace the older ones. Please continue to share feedback such as reporting needs with your Account Manager or the Support team. Glad to hear that the roll out was smooth and your employees also love PiiQ. Once again, thank you for your time and feedback! I like the appearance of the screens, they are user-friendly and pleasing to the eye. I preferred the concept of Archiving reviews in the prior version, however, I do like the formatting of this version for the review. Give it a try - it may be the right product for you! Consistently conducting reviews and encouraging consistency in those reviews/ratings by having the standards readily available. Thank you so much for your review! I am glad to hear that you find PiiQ user-friendly! I appreciate your feedback around the ability to archive reviews. PiiQ is different in that you are able to archive reviews in the way you were used to on Growth Edition 1.0. We did this because we found that admins sometimes needed to correct errors and make changes once a review was finished, and GE1 didn't allow for that. Instead, on PiiQ, you are able to lock/unlock reviews making them read only/editable. When you lock a review, it means it is archived and no longer live. Here's how you can do that: https://help.piiq.csod.com/docs/edit-a-review-cycle. If you have any questions, please don't hesitate to reach out to me at bgoodman@csod.com. Great experience overall. Some features could be improved, for example allowing two managers to conduct review for one employee. Thank you so much for your feedback and glad to hear that you have a great experience overall. The PiiQ team is committed to ensure that our clients will have a successful client experience. Thus we are continuously working on improving the system, and adding new features and enhancements, such as the Multi-Manager review feature which you speak of. To understand our upcoming roadmap, I invite you to reach out to PiiQ Support at piiqsupport@csod.com for more information. Additionally, we would love to hear what other features you think could be improved. Thank you again for providing feedback and we hope to continue providing the best client experience! Thank you so much for providing feedback and great to hear that you are able to customize the system according to your taste! Regarding to the necessity of inputting password to mimic when already signed in as an admin, we do implement such a protocol for security reasons and to be compliant with data integrity. However, I do understand that this might not be as user-friendly as intended. Thus, I will provide this feedback to the Product team for future consideration on enhancements for the mimic function. Thanks again for putting in the time and if you have any further questions, please feel free to reach out to Support at piiqsupport@csod.com. Managers and employees can easily access and complete their reviews. Setting up a performance review is cumbersome. Thank you for your feedback! We really appreciate you taking the time to let us know your experience with PiiQ. I'm glad that PiiQ Performance is helpful to your managers and employees, and to you for managing the performance reviews. Great to hear that your employees find it easy to use as well. On the flipside, I'm sorry to hear that you had difficulties when setting up the performance review. We do have our Onboarding Services available for any clients that need assistance with creating/modifying the review forms. Should you be interested in this, please feel free to contact your Account Manager, Brent Goodman, for more information. If you have any other questions, please let us know if there's anything we can do to help. Thank you so much for taking the time to give us a review. We are happy to hear that the system is easy to navigate and webinars have been supporting your journey. I'd love to understand what you mean by you cannot see last year's reviews to compare to. Please feel free to email me at piiqsupport@csod.com at your convenience. Thank you again for your feedback and I look forward to hear from you! Thank you so much for your feedback and glad to hear that the system is more user friendly and customizable. The PiiQ team is constantly working to ensure clients will have a successful client experience. With that comes with developing new features and enhancements. The ability for more than one reviewer/manager per employee is on our road map. For more information about the upcoming improvements, please reach out to PiiQ Support at piiqsupport@csod.com. "Great Customer Service and user friendly. " I love the customer service I get from my representative Brent Goodman. I'd love to understand what changes you are limited on making so that I can pass this information on to our development team. Please feel free to email me at bgoodman@csod.com at your convenience. "A few years working with PiiQ"
Some administrator functions could still use some work. Thank you so much for providing your feedback around PiiQ. I'm am glad you like the upgrade and how easy it is to use. I also appreciate your feedback around admin functions and would love to understand how and what we can improve. I'll send you an email separately to get more feedback. Thank you for taking the time to give us a review and I look forward to continue working with you. The system is easy to use and customizable, it met our needs.. Customer service are very responsive and helpful.
. I can't think of anything to dislike at this time. Performance Review. The system saved us a lot of time and made review kind of fun. Thank you for your feedback! We're so happy to hear you find PiiQ easy to use. Our team is always here to assist. Be sure to explore the Check-ins feature and capture notes throughout the year, making reviews even more fun and meaningful. Thank you so much for your feedback on PiiQ! We are very happy that you're having a good experience with our product and am glad to hear that PiiQ helped revolutionize the process by organizing everything in one place. We look forward to continue to work with you! If there's anything we can do to help, please don't hesitate to let us know. You may contact us at piiqsupport@csod.com. Learning about PiiQ by Cornerstone? 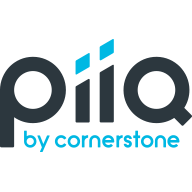 * We monitor all PiiQ by Cornerstone reviews to prevent fraudulent reviews and keep review quality high. We do not post reviews by company employees or direct competitors. Validated reviews require the user to submit a screenshot of the product containing their user ID, in order to verify a user is an actual user of the product. Hi there! Are you looking to implement a solution like PiiQ?